For a pretty comprehensive round up, HuffPo Business was updating all day long with most major articles and tweets from many cities. But perhaps the most convincing voices aren’t of all the people talking about the working poor, but rather, those trying to live on poverty wages telling their own stories. 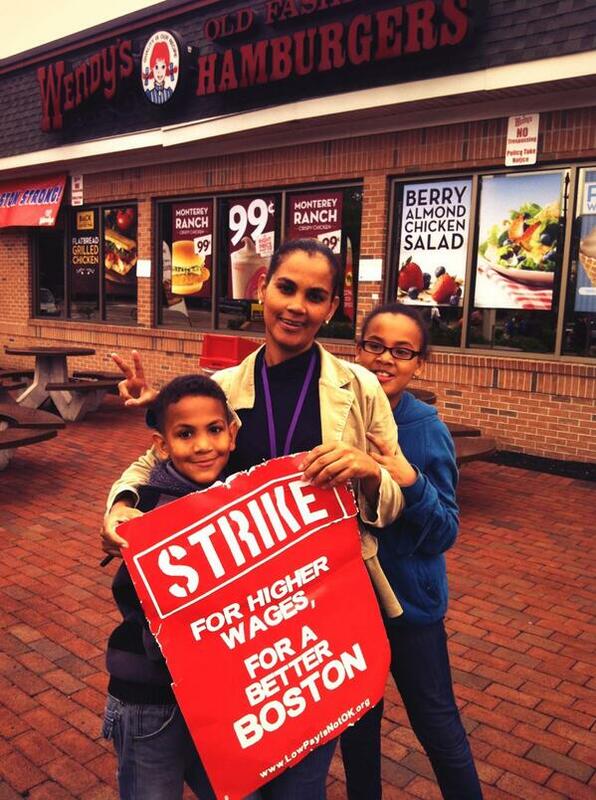 Here are two: “I’m Striking Because I Can Barely Afford To Eat On My McDonald’s Salary,” Business Insider and “How I live on fast-food wages,”CNN Money. And finally, for my own connection to this story. I’ve written about it in scattered pieces before, and its certainly no secret that I grew up poor. 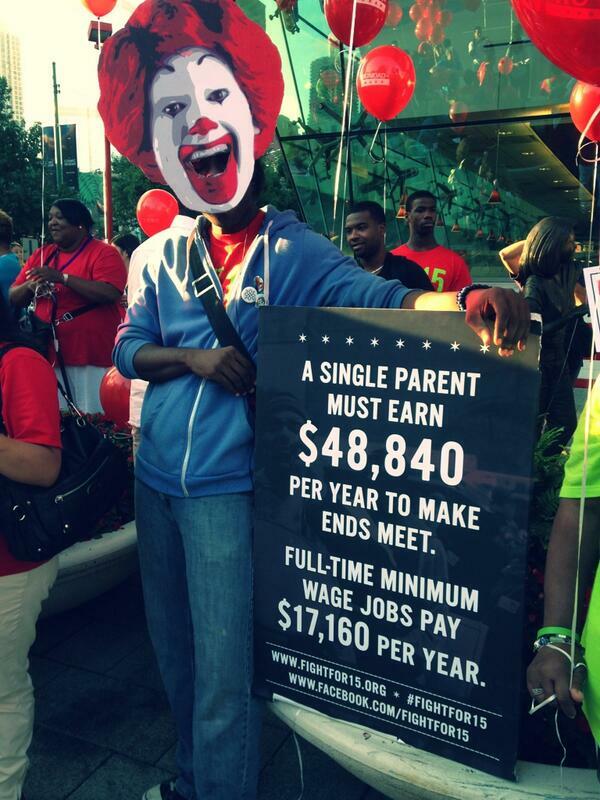 For a portion of my childhood my family struggled to live on minimum (or near minimum) wage. But the circumstances of my childhood poverty aren’t what pundits would have you believe. Both of my parents went to college, and for several years before I was born and in very early in my life they lived a life pretty close to the classic picture of the American Dream: my dad worked a job with good benefits and a good salary, they owned their home, my mom even stayed at home with her kids. Then they got divorced, and my mom, suddenly thrust into the role of sole provider for two very young children, was forced to work at whatever job she could find to try to support her family. So as a 30-something college-educated mother, she took a low-wage retail store (and a Walmart-like discount store). She eventually managed to go back to school (while working full time and raising two kids on her own), and has been working as a nurse for about 20 years, but there was a dark stretch of many years where we were one of the thousands (if not millions) of families struggling to survive on the poverty wages and lack of benefits that the wealthiest country in the world saddles some of their hardest working citizens with. Minimum wage workers are just kids flipping burgers to earn money to take their sweetheart to the soda fountain, they are hard working Americans struggling to keep their heads above water. Workers rights are basic human rights. Like most, I like to think of myself as a good person. In fact, it’s something I’ve never really questioned. I can quickly call to mind a list of evidence of the acts I’ve done, the personality traits I believe I possess, or the compliments I’ve received. But am I in fact, good? And what does “being a good person” even mean? In so many ways I am not good, decent, kind, giving, or any of the other adjectives associated with the type of person I see myself as. It’s easy for me to point to the evidence of the redeeming aspects of myself and actions, but if I give it thought I can tell a totally different story about who I am. Someone who is selfish and self-centered, someone who has been thoughtless and even cruel to people who didn’t deserve it, who withheld help or kindness. I’ve often smugly wondered how those who perpetuate the things that are wrong in the world or those who sit knowingly and idly by as the large and small injustices are perpetuated can live with themselves. I am better, I am good, I think. But am I really that different? Are any of us? I’m not talking about the heinous crimes of humanity like murder and exploitation, but the small everyday cruelty — ignoring panhandlers, not giving up your seat, curt words to your spouse. I think modern life, especially in a big city, offers a certain amount of anonymity. It’s almost necessary to give yourself distance in your mind from the rest of humanity for the lack of physical distance you have. Cold reserve becomes an unquestioned default. Maybe what separates the “good” people and the “bad” people is simple realization. More than a conscience, it’s awareness, participation in life, connection to other living beings. And it’s something I plan to endeavor to do more of. Frankly it sounds exhausting. But it’s a more authentic “goodness” — virtue that’s comfortable and convenient serves the doer more than the community. But like anything, I think, we have to also allow ourselves to fail. No one can be good all the time. Even Mother Teresa probably rolled her eyes sometimes. “Over the course of the past 36 hours I’ve watched a nation, who’s struggle for freedom and democracy is very near to my heart, fall into all-out chaos and disaster. Keeping an eye on the steady flow of images coming out of Egypt, many of which depict horrific death and destruction, is no easy task, and one that breaks my heart. Check out his photos here. And speaking of talented photographers that I know: I am soooooo lucky to know the amazing Yosra El-Essawy, who aside from taking beautiful photos of lucky couples like Mark and I, recently completed the amazing gig of being Beyonce’s official world tour photographer (yeah that’s right, she’s THAT good). She is battling cancer right now and she is doing it with so much strength, positivity, and gratitude…to say that she is inspiring would be a huge understatement. I can’t imagine I would be anywhere near as graceful in her place. I feel so lucky to know her, and so happy that she is surrounded by so much love. And in keeping on the theme of inspiring people I know, my former boss (former Editor-in-Chief of Popular Photography), John Owens, has written a book about the state of the Education system in the U.S., prompted by his recent experience as an English teacher in the Bronx. It came out earlier this month and my copy just arrived today. And here is a full list of 50. And finally, I also saw this posted on Facebook today, and it makes me miss my slam poetry days in college. As my friend Joan said, is is “sweet and sad at the same time (with a dash of crazy).” Enjoy.